Canada’s long debate over cannabis legalization ended this summer with the passage of its new law, which will go into effect Oct. 17. In one form or another, cannabis consumers will able to partake legally in the largest regulated market in the world this week. Going forward, those regulations will continue to be ironed out into a more conducive business climate and in a way that meets growing consumer demand head-on. In these impending early days, each province will regulate adult-use sales and consumer use in different ways. Government-run corporations will oversee the distribution and tracking of cannabis products; a blend of private retail storefronts, online ordering and delivery services will connect the nascent adult-use market to the country’s anticipated consumer base. In Ontario, which lays claim to the federal capital, Ottawa, and the country’s largest city, Toronto, the conservative provincial government will open its doors to the market on Oct. 17 with a government-run online sales portal. Presently, the province is working through cannabis retail business applications; storefronts will be opening and operating sometime in April 2019, and the province has chosen not to place a cap on the number of licenses issued (only one retail license per grower, however, will be permitted). In British Columbia, home to Vancouver, provincial regulators have been slow to issue those retail licenses; only one storefront will be open on Oct. 17, kicking off an imbalance sense of supply and demand from the outset. Already, industry stakeholders are predicting an early wave of “sold out” signs across the marketplace. But more broadly, the Canadian precedent is a signal to the rest of the world, a moment in time that captures how powerful this 21st-century wave of reform really is. Across the border, in the U.S., it’s not yet entirely clear what the federal government is making of all this. “Canada is setting a strong example for how to end marijuana prohibition at the national level and replace it with a system of regulated production and sales that is largely governed at the local level,” MPP Executive Director Steve Hawkins said in a public statement. “The U.S. and other countries grappling with the complexities of such a significant policy shift will have an excellent opportunity to learn from the Canadian experience. This side of the border, indeed, the contrast will become clear. The global cannabis market is looking away from the U.S. for its sources of capital and its broad market reach. At the top of the market, companies like Canopy Growth Corp., Aurora Cannabis, Tilray and Aphria are lining up prospective partnerships with major consumer packaged goods businesses and mainstream companies (like Coca-Cola and Constellation Brands). Those licensed producers are capitalized to grow only more influential under a legal adult-use scheme. The Canadian legislative progress has also opened the door to public investment, leading many licensed cannabis producers to trade on the Canadian Securities Exchange and the Nasdaq—further distancing themselves, in a financial sense, from much of their competition on a global playing field. Canada, which joins Uruguay as only the second country in the world to legalize cannabis, is now positioned as the global leader in the business. Its established export model, which is propping up medical markets in Europe, for instance, is a firm backbone for the country’s domestic marketplace. 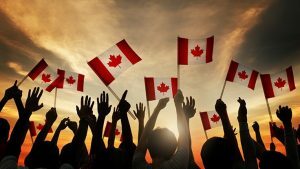 The relationship between Canada and the U.S., then, in terms of cannabis reform, will be a noteworthy narrative in 2019.